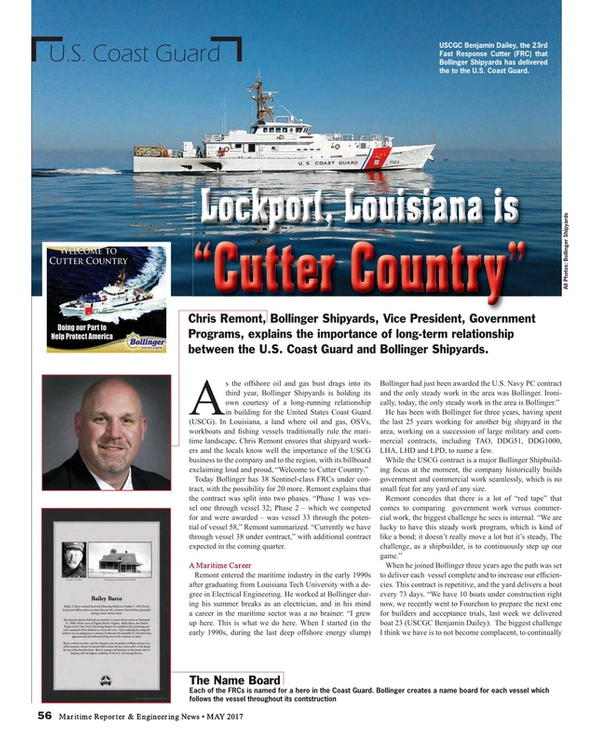 Chris Remont, Bollinger Shipyards, Vice President, Government Programs, explains the importance of long-term relationship between the U.S. Coast Guard and Bollinger Shipyards. Today Bollinger has 38 Sentinel-class FRCs under contract, with the possibility for 20 more. Remont explains that the contract was split into two phases. “Phase 1 was vessel one through vessel 32; Phase 2 – which we competed for and were awarded – was vessel 33 through the potential of vessel 58,” Remont summarized. “Currently we have through vessel 38 under contract,” with additional contract expected in the coming quarter. He has been with Bollinger for three years, having spent the last 25 years working for another big shipyard in the area, working on a succession of large military and commercial contracts, including TAO, DDG51, DDG1000, LHA, LHD and LPD, to name a few. While the USCG contract is a major Bollinger Shipbuilding focus at the moment, the company historically builds government and commercial work seamlessly, which is no small feat for any yard of any size. If recent performance is any indication, it would appear that the goal has been achieved. To help combat complacency Bollinger came up with the Sentinel Program, to both incentivize its shipbuilders and to make each vessel more meaningful to them. “Each of these vessels is named for a hero in the Coast Guard,” Remont said. For every vessel Bollinger creates a name board, a 4 x 3 board that describes the ship’s namesake with details of their heroic act. “What we’re trying to do is personalize it for our shipbuilders. It’s not just some big hunk of metal with a bunch of cables, it (the ship) is there for a real reason. We erect these sign posts at each station where the vessel is getting created, and the name board follows the ship, traveling with the boat as it moves through the production line. “Every time our shipbuilders get on that vessel they can read about the person, and understand why we are building it.” When the vessel is delivered the name board is given to the CO of the boat so that they and the crew can be reminded of the namesake, too. Following the delivery ceremony, Bollinger selects one employee from each department who exhibits the same characteristics of the vessel’s namesake, and they are publicly recognized and awarded.